It’s impossible not to notice Raphael Lavoie each time he steps on the ice, and he’s fun to watch. There’s something alluring about watching a hockey player with a big body demonstrate soft hands, skating ability and an absolute determination to score. Combine that skill with the way the 6-foot-4 Lavoie uses his Mario Lemieux-like reach to dart around opposing defencemen and you can see why he has become worth the price of admission in Halifax in the past calendar year, and it’s likely to only get better. “He has the ability to pull fans out of their seats with his skill level,” said General Manager Cam Russell. There were glimpses of what was to come late in Lavoie’s rookie season including the 2017 playoffs against Rouyn-Noranda but he really busted out as a 17-year-old in 2017-18. Lavoie’s name became well known around the league after he scored 30 goals and 63 points in his sophomore season. Now he’s poised to become one of the QMJHL’s upper echelon players in this, his NHL Draft year. Born in 2000 but with a late September birthday, the Chambly, QC native missed the 2018 NHL Entry Draft cut-off date by just 10 days and is currently being touted as a potential top 10 pick come next June at Rogers Arena in Vancouver. In fact, TSN’s Craig Button has him listed 7th among draft eligible players on his season opening edition of Craig’s list. “For sure it’s an important year personally but I think I’m more focusing myself on the Memorial Cup and winning that because that will be our main objective,” Lavoie said. Button, the Director of Scouting for TSN, explains why he considers Lavoie to be ranked among the best draft eligible prospects in the world. “You get excited when you see a very skilled player who can do things seemingly with ease. All things being equal, and they rarely are, you will take a bigger player over a smaller player and Raphael has the high end skill with size that makes him very difficult to defend against. The Mooseheads have consistently produced high-end NHL talent throughout the decade. 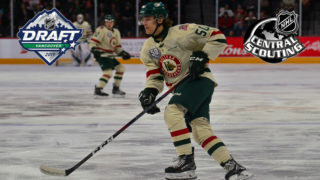 Should Lavoie become a first round pick next June, he would join Nathan MacKinnon (1st overall – 2013), Jonathan Drouin (3rd overall – 2013), Nikolaj Ehlers (9th overall – 2014), Timo Meier (9th overall – 2015), Nico Hischier (1st overall – 2017) and Filip Zadina (6th overall – 2018) as Mooseheads players to be selected in the opening round of the NHL Entry Draft since 2013. Russell said he has all of the elements that NHL scouts are looking for in a prospect. Lavoie was a late addition to Canada’s World Junior development camp in July and could be a wildcard to make the squad this Christmas. Lavoie enjoyed major success with Canada at the U18 World Championship in Russia in April where he got the attention of scouts by tying for third in tournament goal scoring with five goals in five games. Button wouldn’t be shocked if he played his way onto the World Junior team in Vancouver. 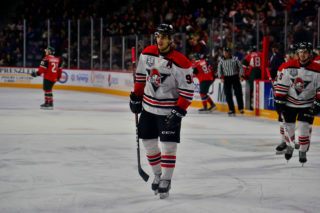 The big forward originally came to the Mooseheads in 2016 after the team selected him in the second round (29th overall) at the QMJHL Entry Draft held in Charlottetown. That draft proved to be a boon for the Herd with Benoit-Olivier Groulx and Jared McIsaac taken with the top two selections and goalie Alex Gravel also taken by the Moose with the 20th overall pick. Given the numbers Lavoie has produced, he may turn out to be the steal of the draft. General Manager Russell considers the Mooseheads to be very fortunate with the way things have worked out. 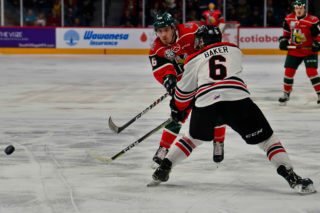 This season, Lavoie is part of a Halifax Mooseheads team that will be vying for the Memorial Cup Championship when the organization plays host to the prestigious CHL tournament May 17-26. With the added attention surrounding the team, he will undeniably receive plenty of media exposure. He hopes to take advantage of the special situation. “I hope so. I mean I’ll be trying to have the best year that I can and have the best draft possible for me. 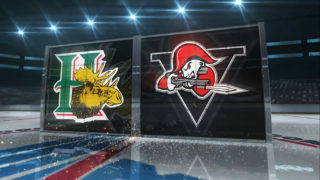 The Mooseheads will have the strength of scoring depth on the roster with many forwards capable of scoring 20-plus goals. New faces up front that will add to the veteran leadership include recent Memorial Cup Champions Antoine Morand and Jordan Maher who captured the title with the Acadie-Bathurst Titan in May before being shipped to Halifax in a blockbuster trade less than a week later. 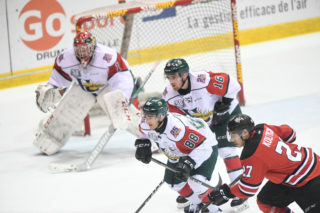 Not only did Lavoie score 30 times last season but he etched his name in Mooseheads lore when he set a new QMJHL record with six overtime goals which included an incredible stretch of four OT winners in five games between January 6-13. While nothing is set in stone for Head Coach Eric Veilleux and his staff, there’s a strong chance Lavoie will play right wing on a line with Morand at center and Arnaud Durandeau on the left wing. That would place two of the most skilled goal scorers on the team with perhaps its best set-up man in Morand. Button had a sentence that maybe best exemplified the way Lavoie carries himself on the ice. 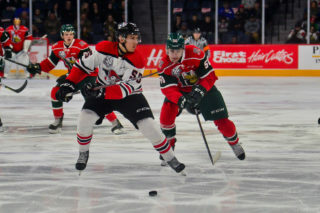 The timing of Lavoie’s emergence couldn’t be better for the Mooseheads as the team prepares to embark on the 25th anniversary season and the drive to the Memorial Cup. It won’t be long before chants of Go Moose Go will be heard from within the hallowed walls of the Scotiabank Centre. The regular season kicks off later this month and the Mooseheads home opener will take place on Saturday, October 27th at 7pm against Cape Breton.